Like the buildings and boats that architects design, the way they share their design renderings with clients is constantly evolving. 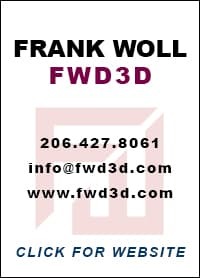 Frank Woll has remained at the forefront of technological innovation since he began offering industrial design services in 1994 as Frank Woll Design. Recently, the company updated its name to FWD3D to reflect the latest advances. It has also been increasing its focus on projects here in the Puget Sound region. “Our long-term immersion in technology as well as our decades working on complex projects allows us to produce, design and visualize in a unique way,” Woll told Seattle Arts & Architecture. FWD3D is an interactive design studio for architects, real estate developers, yacht builders, and product manufacturers. The company has used drones for HD video and photography to capture landscape imagery that is then integrated in 3D renderings for commercial real estate projects. It also has several in-house 3D printers to provide rapid prototyping and modeling for client presentations. The company’s latest endeavor is to combine Woll’s 3D design skills with virtual reality (VR) software to develop virtual walkthroughs that assist architects with project planning and design. “The VR capability is really useful for commercial real estate developers who want to start pre-selling or pre-leasing even before ground is broken on the full-sized model unit,” Woll said. The company’s design work covers a wide range of real estate projects, from townhouses to single-family residences to industrial projects like the SODO Honda/Toyota dealership. One memorable project was redesigning the Niebaum-Coppola Winery’s main house, which belongs to Francis Ford Coppola and his family. Among the changes was moving and widening the main stairway to improve traffic flow through the building, which is heavily used for events and visiting VIPs. While Woll would spend a week at a time on site, he would be treated to Francis’ Italian cooking and fine wines. Mike Bratter, who joined the company last year, has helped rebrand the studio as FWD3D and give its website better emphasis on the company’s capabilities. 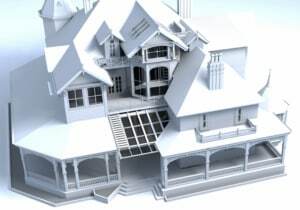 The company can also provide a distinct look and feel for real estate developments that the developer wants to distinguish from competing projects. “Because of the building boom in the Seattle area it’s really important that each project is presented in the most compelling and innovative light,” Bratter said. 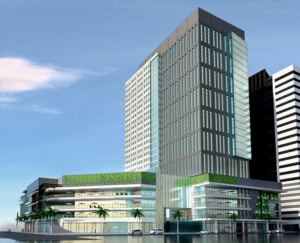 The company is currently working with Seattle architect John Gish on a high-profile mixed-use commercial project in Asia for a commercial real estate developer in the Philippines. Photos: Top, Mike Bratter and Frank Woll; center, Paul Allen’s ‘superyachts’ MV Octopus and MV Tatoosh and the 3D rendering of the Niebaum-Coppola Winery’s main house; bottom, the design for the Gish mixed-use commercial project in the Philippines.